Here are some ways developers can fix them. I'm not a super fit person. I am considered a healthy weight, and I exercise simply because I enjoy eating and drinking whatever I want. For my type A personality, fitness and health tracking has been an incredible motivator. Being able to close all the rings on my Apple Watch is enough to get me on the treadmill desk or spin bike instead of just sitting with my laptop in front of the television. But since becoming pregnant with my first kid, all that's changed. I was determined to have a healthy pregnancy; while I'm not too particular about what I eat, I wanted to exercise regularly and gain a reasonable amount of weight. I figured my fitness-tracking apps would be a real help in monitoring my goals and progress. I was laughably wrong. Seven months in, I've stopped all fitness and weight tracking because these apps don't take my pregnancy into account. I had been using an Apple Watch to make sure I was burning an adequate amount of calories and getting enough exercise. Additionally, I relied on my Eufy BodySense Smart Scale to track my weight gain, setting a personal goal of 25 to 30 pounds, based on my doctor's recommendations. As my weight started creeping up, though, I noticed that Eufy was telling me that it was too high -- that I was gaining an unhealthy amount of weight when in fact I was right in line with where I was supposed to be. I went into the settings to toggle some sort of pregnancy mode, and I was shocked (and yet not at all surprised) to discover there wasn't one. Eufy hadn't bothered to consider the idea that some of its users might want to procreate. In her book Technically Wrong: Sexist Apps, Biased Algorithms, and Other Threats of Toxic Tech, Sara Wachter-Boettcher chronicles the myriad ways that tech fails people who aren't considered the norm. But pregnancy isn't an uncommon condition. According to the Centers for Disease Control, there were almost 4 million births in the US in 2016. There were 62.5 births per 1,000 women aged 15 to 44. Yet the bulk of fitness- and health-tracking apps I came across didn't even bother to consider pregnancy as a possibility. "When Apple Health launched, it didn't even include a period tracker -- for a full year. At this point, it shouldn't surprise us when products fail to meet women's needs: Not only are there way too few women in Silicon Valley in general, but there are incredibly few women investors." In my case, Eufy's team had failed to take into account a health condition that has the potential to affect a full half of the population: pregnancy. By presumably trying to streamline its app as much as possible, it is failing up to half of its potential user base. My Apple Watch was a similar story. I was closing those Activity rings through the first half of my pregnancy. Then, when I hit my third trimester, the physical changes began to take a toll. My doctor recommended dropping to about 30 minutes of brisk walking three times per week -- that would keep me fit and healthy for the remainder of my pregnancy. Again, I found that the Apple Watch didn't and could not take pregnancy, or any other health condition, into account. I'd experienced this on a one-off basis when I was too sick to get out of bed, but my Watch kept pestering me to close those rings. There was no option for a sick day, and I Iost any streak I was working toward. This was actually encouraging unhealthy behavior by failing to account for off days when my body wasn't up for the exercise. Now I faced three months of being pestered about my activity level on a daily basis. I couldn't tell the app, "Hey, this is actually what is healthy for me right now," and because of that it had become completely useless. More than that, it'd become a constant source of anxiety, reminding me that I wanted to be more active than I was physically able to be. Rather than using it to track my activity during my third trimester, I turned off notifications altogether and removed the Activity Rings from my Apple Watch face. Anyone who has an Apple Watch and has been ill (especially chronically), injured, pregnant or some other slight deviation from what app developers consider "normal" knows exactly what I'm talking about. I took to Twitter to express my frustration with the issue. And people responded. Hey tech developers: It'd be really nice if you put a "pregnancy mode" in your weight/training/workout etc. apps. I'm getting really tired of my smart scale and exercise apps yelling at me for weight gain/decreased activity. The responses ranged from women saying, "I have been asking for this feature for years" to people scolding me for relying on apps and technology to motivate me to work out. (Cue the millennial bashing.) I was struck by a few of the responses. First, it was strange to see the numerous people who lauded me for my "good idea." I wasn't even close to the first person to have this idea; plenty of women have experienced the frustration of being excluded from their fitness and health apps due to pregnancy. I'm just one of the latest. What's more, including pregnancy tracking in health and fitness tech -- which is how every single human in this world came to be -- should not be a second thought. It's not just a "good idea." It shouldn't take a random woman on Twitter getting angry that this doesn't exist for it to occur to app developers to include this. Second, I was exposed to the myriad ways that tech has failed a significant percentage of the population. From hearing stories about how women-developed period-tracking apps like Cube don't have a pregnancy mode (the one I use personally, Flo, does) to calorie-counting apps not allowing a breastfeeding mode to take increased calorie intake into account, tech has failed the bodies of biological women more than it's served us. People have been apparently asking Fitbit for a pregnancy mode for years and have been met with complete radio silence. But it's not just women. By not including the ability to customize many of the goals, the apps routinely fail a significant percentage of the population. Many weight-tracking apps do allow you to input a target weight, for example, but that doesn't stop them from telling you that your weight is too high. People recounted a lack of exercise tracking for walking or running while pushing a stroller, weight-tracking apps not understanding the need to gain weight, the lack of an injury/illness mode on these apps wreaking havoc on morale and much, much more. Third, people kept asking why I didn't just turn off notifications. For weight tracking, notifications weren't a problem: It was when I opened the app to see my weight that I was told my weight was "high." And eventually, I did turn off Apple Watch notifications, but the point is that the usability of these apps shouldn't be conditional on my level of health or fitness. I should be able to track my pregnancy activity as easily as I was able to for my nonpregnant self. 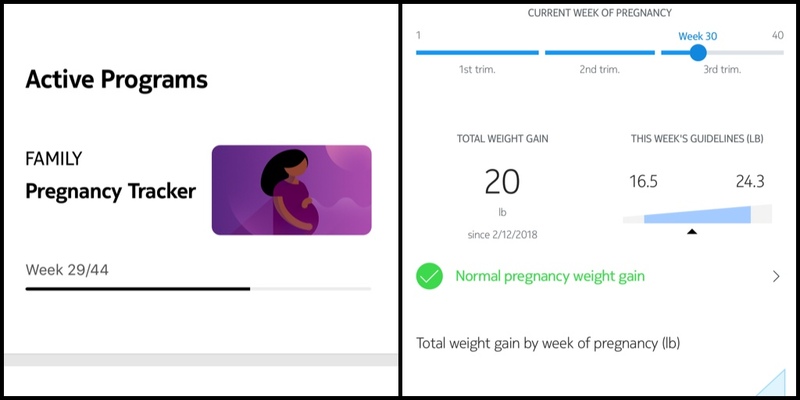 Adding a pregnancy mode for weight tracking would be pretty simple: The weight-gain recommendations (and calorie-count increases per day) are standard based on how much you weigh when you conceive and whether you're having multiples. For fitness tracking, it would be as simple as creating customizable goals rather than being forced into whatever developers think is "healthy" for you. Fitness devices such as the Fitbit should also allow for tracking even when your hands are pushing a stroller. And calorie apps should have both pregnancy and breastfeeding mode to allow for higher caloric intake. Sleep-tracking apps should also have a "newborn" mode; after all, parents don't need their tech scolding them about not getting a good night's rest when they're up during the wee hours of the night with a baby. And finally, it should go without saying that these modes should be easy to toggle on and off: No one needs to be reminded of pregnancy-activity tracking if she has suffered a miscarriage. However, some apps do take pregnancy into account. Weight Watchers has both pregnancy and breastfeeding modes. And multiple people shouted out to Withings for having a pregnancy mode on its Health Mate app. While it can be used in conjunction with the company's smart scale, owning the device isn't necessary to track your weight and health through the app. "Nokia Health/Withings launched Pregnancy Tracker in May 2017," Susie Felber, the Global Content Director of Withings, explained to Engadget. "As you can imagine, a lot of work went into it. It's so much more than a tech issue -- we not only track and advise on healthy weight gain, we adapt the experience so that things like body composition are turned off. The app also features obstetrician-reviewed content for every stage of pregnancy." Pregnancy Tracker was specifically important to Felber because she's a mother of two. "Beyond weight, pregnancy comes with a host of other serious health issues," she said. "Helping people understand what's natural, what you can do and what you should talk to a doctor about is really important." Part of Felber's contributions to the feature include what she wished she'd known during her pregnancy. When I asked Felber why she thought so few of Nokia Health/Withings' competitors had a pregnancy mode on their app, she said, "I won't speculate. I'm proud that we do have it." This issue is not unique; many people struggle with their fitness-tracking and health apps during pregnancy. And while a big part of the problem is a lack of women in tech (and women investors, as Wachter-Boettcher pointed out), it's also a lack of women from different age ranges. After all, if I'd been hired to represent all women at the age of 23 or 24, would I have had the foresight to think about the health of women decades older than me? I'm not sure I would have considered how pregnancy and menopause can affect women's health and the kinds of changes needed to be made to apps to accommodate those inevitable stages in the majority of women's lives. The key is including women from all age ranges and backgrounds, covering a wide variety of viewpoints on issues like this. My hope is that my tweet, and this subsequent article, will inspire (or at least shame) developers to do better when it comes to serving more than half the US population.